Balustrades are an important feature of any elevated patio, balcony or internal structure of your home. There are a great number of reasons for this; the most predominate of which is safety and design appeal. It is a legal requirement under Queensland building codes, that a balustrade be installed where a drop of one metre or more is present. Some might find this an inhibition to the design of their house – certainly in instances of more contemporary design – however this need not be the case. Balustrades range in construction from aluminium and wrought iron, to timber and glass. When selected correctly, designer balustrades can enhance the aesthetic features of any building and this guide seeks to outline some of the more important factors that ought to be considered when investigating a suitable balustrade for you. What is the ideal material for balustrade? There is a plethora of materials available for the construction of a balustrade – both indoor and outdoor – and each option offers a range of advantages or disadvantages. Listed below, are a number of the more commonly encountered choices. Glass balustrades are typically favoured in contemporary buildings, for their seemingly low profile nature. Whilst this might be the case in some instances, there are numerous shortcomings that are inherent with the very nature of glass as a substance. Most notably, glass does not offer the same degree of safety as some of its more durable alternatives – it is brittle, heavy and unmalleable. These features mean that is not adequately resistant to impact and can shatter or crack under certain circumstances. By virtue of its purpose, balustrading ought to be strong and capable of preventing harm to those on an elevated platform – irrespective of impact or any other negative externalities. Furthermore, the minimalistic design utility of glass means that it must be maintained stringently and kept free of smudges or scratches. This upkeep is necessary to ensure that the glass remains visually appealing and structurally integral and means that glass balustrading is perhaps unsuitable for most applications. Timber is becoming much less prevalent in the construction of balustrades, as well as other visual structures of homes in general and it is arguable that there is good reason for this. Timber lacks the durability and strength of its more advanced counterparts and is often far less appealing in terms of design. For indoor use, standard timber such as pine is comparatively weak and in most instances, lacks the elegance and style that is requisite of a good balustrade. A substitute for this might be a boutique, aged wood such as oak or mahogany. These might suit the classical design of some well-maintained older houses, although it would have a cost to match. Such materials are usually in excess of an average budget and suitable only for a rather specific design of house. Externally, timber is highly susceptible to damage from a number of sources. In particular, moisture can rot timber balustrades quite quickly and termites can destroy them in a matter of months. As a consequence, the upkeep required for an outdoor timber balustrade is such that most should avoid it in favour of a low-maintenance, more durable and affordable alternative. Aluminium might seem a viable alternative to the abovementioned materials, however it too has a number of pitfalls that render it unsuitable for application in most circumstances. At the forefront of these limitations, is strength. Whilst considered strong for its weight, aluminium is highly malleable – so much so that any solid impact is usually sufficient to disfigure it. Often, aluminium balustrades will be riddled with small dents or bends and this is quite unsightly. Additionally, aluminium fabrication is arguably the more costly of metal manufacturing and its delicate nature means that there are few fabricators who are capable of creating intricate or extensive designs. Consequently, the design options that are available to consumers are somewhat limited and may not be suitable to many indoor settings. The limited versatility of aluminium means that it is not appropriate for most balustrade applications. Wrought iron has been favoured as arguably the primary material used in the construction of balustrades for centuries and there are many good reasons for this. There has been a dynamic shift in its application, however, with modern technology and skill surpassing its previous adaptability. As a result, wrought iron can now be shaped into designs so intricate, that were previously difficult to achieve. This means that wrought iron can be used to shape balustrades that range in style from timeless and classic, to contemporary and designer. The application of such balustrades can be tailored to the most unique of houses and specifications and this diversity places wrought iron at a distinct advantage over its counterparts. Furthermore, wrought iron is one of the most durable, strong and robust substances available in construction. It is malleable enough to be fashioned into elaborate shapes and patterns, but strong enough to withstand immense pressure and impact. Consequently, a balustrade of wrought iron guarantees the safety of anyone on your balcony or staircase. As well as this, the carbon found within wrought iron ensures that is does not rust and it can therefore be employed in an outdoor setting, with no maintenance requirements. What styles are suited to wrought iron? As stated above, wrought iron has been favoured for use in this way, over a number of centuries and certainly does not go out of style – in fact it is suitable for all styles. Many of the classical buildings found in the heart of Australian capital cities are adorned with wrought iron balustrades and this was often thought to be the primary use for such balustrading. The aforementioned advancements in technology have, however, made much more contemporary wrought iron creations possible. It is likely that you would find wrought iron balustrades bordering anything from the balconies of Mediterranean style villas on the Gold Coast, to trendy inner-city apartments in Brisbane. Not only this, but there is an increasing demand for parallel iron balustrades on internal staircases. These also, are suitable for urban-contemporary designs or classical and traditional structures. Alternatively, you may wish to add a designer touch to a landing or courtyard that is not elevated at all and wrought iron balustrades are perfect for this – they create that courtyard appeal, whilst maintaining a high degree of practicality. 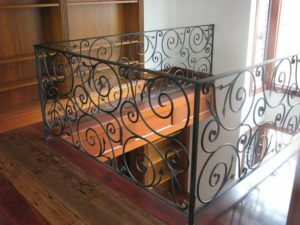 Overall, it is evident that the ideal material from which to construct balustrading is wrought iron. There is no doubt that a design can be crafted specifically for your needs and by consulting your local specialist you can tailor a solution for any internal or external elevations, that will add style and elegance to your home. Contact Dean-Wilson Iron today to install designer balustrades in your home.